In the 3rd year of Cyrus king of Persia, a revelation was given to Daniel about a great war. The understanding of the message came to him in a vision. This chapter relates the beginning of Daniel's last vision, which is continued to the end of the book. This revelation took place in third year of Cyrus. Two years had passed since Gabriel revealed to Daniel the prophecy of the seventy weeks. The first group of exiles had returned to Jerusalem but Daniel and many others remained in Babylon. Seventy years later, Daniel is still remembered by the name Belteshazzar which was given to him by Nebuchadnezzar’s chief official. 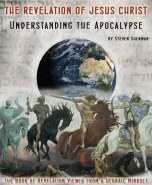 This chapter reveals the fact that, behind the scenes of world events and political changes we behold on an earthly level, an unseen spiritual war of cosmic proportions is being waged. A good portion of the time of Daniel’s fast from meat and wine took place during the Passover and the Feast of Unleavened Bread. Anointing with oil was a sign of rejoicing; therefore Daniel used no lotions for 21 days because he was in mourning. Daniel was standing on the bank of the Tigris River which was located thirty-five miles from Babylon. Above the vault over their heads was what looked like a throne of lapis lazuli, and high above on the throne was a figure like that of a man. I saw that from what appeared to be his waist up he looked like glowing metal, as if full of fire, and that from there down he looked like fire; and brilliant light surrounded him. Like the appearance of a rainbow in the clouds on a rainy day, so was the radiance around him. Even Daniel’s description of the thunderous voice of the man who spoke to him indicates that this man was no mere angel. Both the physical appearance and the voice of Daniel’s visitor fit the description of a divine being. Those who were with Daniel did not see the vision of the glorious man but neither did Paul’s companions who were traveling with him on the road to Damascus see the Lord who appeared to Paul. Paul’s companions neither saw the Lord nor could understand His voice. This man who appeared to Daniel was no mere messenger but the Son of God. This supernatural revelation and glorious vision of the second person of the holy trinity sapped Daniel of his strength and Daniel fell into a deep sleep while he listened to Him. The Son of God not only appeared to Daniel in the form of a glorious man but several times in the Old Testament the Messiah materialized as the angel of the LORD. The pre-incarnate Christ came to Hagar after she has fled from the abusive Sarai (Genesis 16:7-14) to assure her that God has heard about her misery and that her descendants would be too numerous to count. Hagar names him “You are the God who sees me” (v. 13). The angel of the LORD pronounces a curse on the people of Meroz, because they refused to come to the help of the LORD (Judges 5:23). The angel of the LORD executes judgment on behalf of the LORD. He puts to death 185, 000 Assyrian soldiers in their camp, thereby saving Jerusalem from decimation (2 Kings 19:35). Manoah meets the angel of the LORD, and declares that he has seen God. The angel accepts worship from Manoah and his wife as no mere angel, and refers to himself as “Wonderful” the same term applied to the coming deliverer in Isaiah 9:6 (Judges 13:9-22). The functions of the angel of the LORD in the Old Testament prefigure the reconciling ministry of Jesus. In the New Testament, there is no mention of the angel of the LORD. The Messiah himself is this person. The pre-incarnate Messiah Jesus appearing as the “Captain of the LORD’s hosts” commands Joshua to remove his sandals as He did to Moses at the burning bush. He appeared as the fourth person in Nebuchadnezzar’s fiery furnace and to Daniel after his three weeks of fasting. Some have confused this glorious being with a mere angel because angels are messengers that are sent by the LORD. But there are several instances in the Bible in both the Old and New Testaments where the Son of God was sent by the Father. Daniel trembled in the presence of this glorious Christophany. Righteous Daniel is one of very few biblical personalities who were highly esteemed by the LORD. Daniel is a wonderful example of the power of the effectual fervent prayer of a righteous man. He humbled himself before God. Daniel, who did not return to his homeland, was anxious to learn the fate of his fellow Jews. The Father heard his words since the first day of his fast and sent His Son in response to his supplications. God did not have to hear all of Daniel’s three weeks of prayer to respond. Daniel the prophet was praying about the future of his people who remained as exiles in Persia. The reason for the three week delay was due to an evil spiritual entity that wielded authority over the ancient kingdom of Persia. The prince of Persia is a fallen angel who in some sense had authority or influence over the physical kingdom of Persia. How could an evil spiritual entity resist the all-powerful Son of God? God has allowed Satan to be the god of this world and the prince of the power of the air for thousands of years. The satanic authority over the kingdoms of sinful men does not compromise the omnipotence of God. God allows darkness to reign for periods of time to accomplish His sovereign divine purposes. How could a mere mortal resist the omnipotent pre-incarnate Jesus? If the angel of the LORD, the pre-incarnate son of God was resisted through the night by a mere man to accomplish His divine purposes, it is reasonable that the heavenly messenger that came to Daniel could have be resisted by a demonic entity to fulfill the sovereign plans of an omnipotent God. Did the Son of God need the protector of Israel, the Archangel Michael’s help to accomplish His purposes? Just as God does not need men to accomplish His purposes but chooses to do so, He also chooses to allow angels to participate in His divine plans. In the first verse of chapter 10 of Daniel we are told that the message he was to receive through his vision concerned a great war. Now, it is made clear that this future conflict will entail the Jews. The major events that will mark the entire future history of Israel culminating in the climax of the “Second Coming of Messiah” and the establishment of His earthly Kingdom will be the subject of the rest of the Book of Daniel. The devastating effect of the Christophany upon the aged Daniel was similar to what the aged Apostle John would experience on the Isle of Patmos. Daniel was overcome by both the glory of the pre-incarnate Messiah as well as having been grieved by his vision of the future calamities that his people would have to endure through. Daniel is told that “the Book of Truth” contains the future events of the ages to come. Daniel needed to understand that the incredible predictions concerning Israel were ordained by sovereign decree and certain to be fulfilled. Although the initial victory had been won over the demon Prince of Persia, the divine/demonic struggle would continue throughout the two hundred years of Medo-Persian rule to the time of Alexander the Great, when the demon prince of Greece would be confronted on behalf of Israel. Although there are wars fought on earth with natural weapons against human armies, the struggle is a spiritual one. For ungodly human rulers who direct military forces are under the demonic influence of the god of this world.